Growing security concerns, increasing construction market, expansion of metro & airport projects, upcoming new hotels & shopping malls coupled with government regulations for compulsory installation of intrusion detection systems across all new projects are some of the key factors that are resulting in the overall growth of intrusion detection systems market in Saudi Arabia. Further, growth in infrastructure spending would lead to higher Saudi Arabia intrusion detection market forecast revenues over the coming years. According to 6Wresearch, Saudi Arabia intrusion detection market size is projected to grow at a CAGR of 18.1% during 2017-23. Intrusion detection market registered a steady growth until 2014, however, the market declined after 2014 due to slump in oil prices, resulting in reduced government spending across various sectors. Though, the market would recover post 2017 due to expected rise in oil prices, ensuing increased government spending to support establishment of new industries related to IT and infrastructural development projects. The Central region accounted for the largest Saudi Arabia intrusion detection market share, followed by the Eastern region in 2016. Growing installation in the commercial vertical would result in an increase in deployment of intrusion detection system in the region. Some of the key players in Saudi Arabia intrusion detection systems market include-Alhamrani Universal Company Limited, Arecont Vision LLC, Azad Tech, Bosch Security Systems, Honeywell, Interlogix, Optex Group, Pelco, Siemens Ltd, Tyco Electronics Corporation. 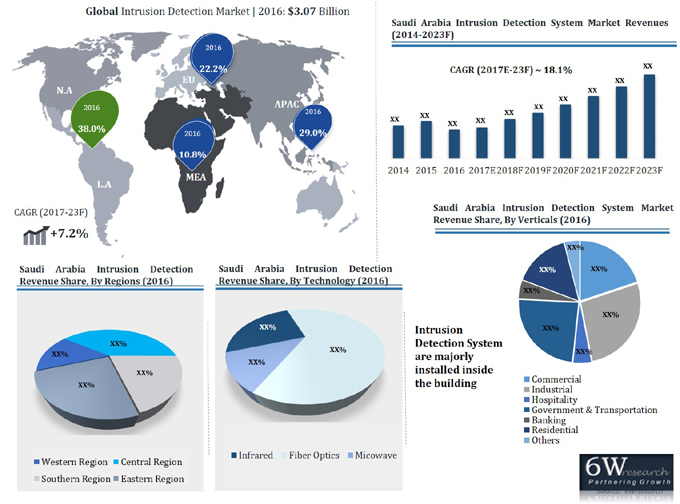 The Saudi Arabia intrusion detection market report thoroughly covers the Saudi Arabia Intrusion Detection market by types, installation, technology, verticals and regions. The Saudi Arabia intrusion detection market outlook report provides an unbiased and detailed analysis of the Saudi Arabia intrusion detection market trends, opportunities high growth areas, market drivers which would help the stakeholders to device and align their market strategies according to the current and future market dynamics. • Historic data of Saudi Arabia Intrusion Detection Hardware Market Revenues 2014-2016. • Historic data of Saudi Arabia Intrusion Detection Software Market Revenues 2014-2016. • Historic data of Saudi Arabia Intrusion Detection Market Revenues, By Technology 2014-2016. • Historic data of Saudi Arabia Intrusion Detection Software Market Revenues, By Verticals 2014-2016. 12.7. Optex Group Co., Ltd.